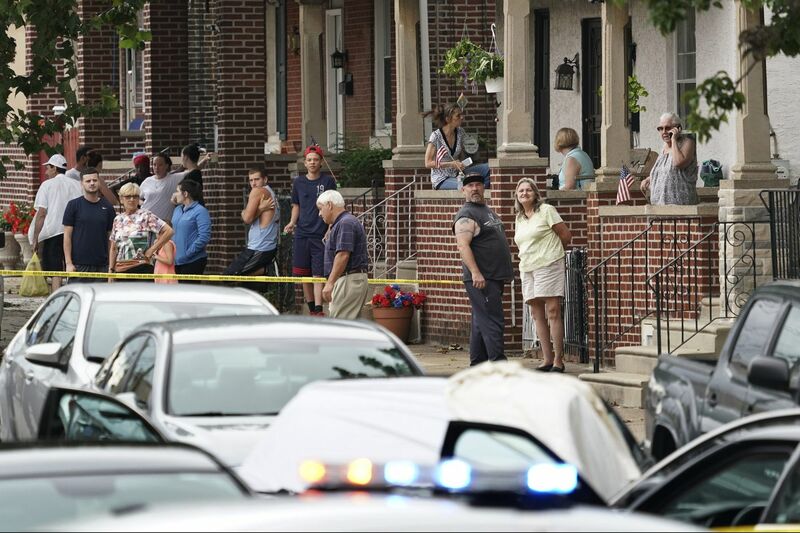 Neighbors look on as investigators gather at the crime scene on Hegerman Street near Princeton Avenue in the Tacony section of Philadelpia, Monday Aug. 20, 2018, after police fatal shot a man. Philadelphia police on Tuesday identified the 36-year-old man fatally shot by an officer after the man allegedly struck another officer with a car Monday afternoon in the city's Tacony section. Jeffrey Dennis, of the 7100 block of Cottage Street, was shot in the head and left arm while behind the wheel of a black 2010 Toyota Camry in the 7100 block of Hegerman Street, police said. He was pronounced dead at the scene by medics. The 53-year-old officer, a 10-year veteran who fired three rounds at Dennis, was not named. The officer who was struck by the Camry was taken to Jefferson Torresdale Hospital to be treated for leg injuries and was admitted in good condition, police said. Two other officers were taken to the same hospital and were treated for minor injuries and released. Shortly after 4 p.m. undercover officers with the Narcotics Field Unit were conducting surveillance on Dennis' house on Cottage Street and were preparing to execute a search warrant when they saw Dennis driving the Camry. Six officers in three unmarked police vehicles followed Dennis and then maneuvered to block the Camry on Hegerman Street. At that point, police said, Dennis began driving the Camry back and forth striking the police cars in front and behind him. All six officers got out of their cars and one used what is known as a Halligan bar, an ax-type tool used by firefighters and law enforcement, to shatter the driver's door window. It was then that Dennis struck one of the officers with the Camry and then was shot by another officer positioned next to the driver's door. That officer has been assigned to desk duty while the shooting is investigated by Internal Affairs.